gulp. on the UK’s newsstands now! – teamgloria, inc.
gulp. on the UK’s newsstands now! Posted on September 30, 2013 by teamgloria in things. whispers…. 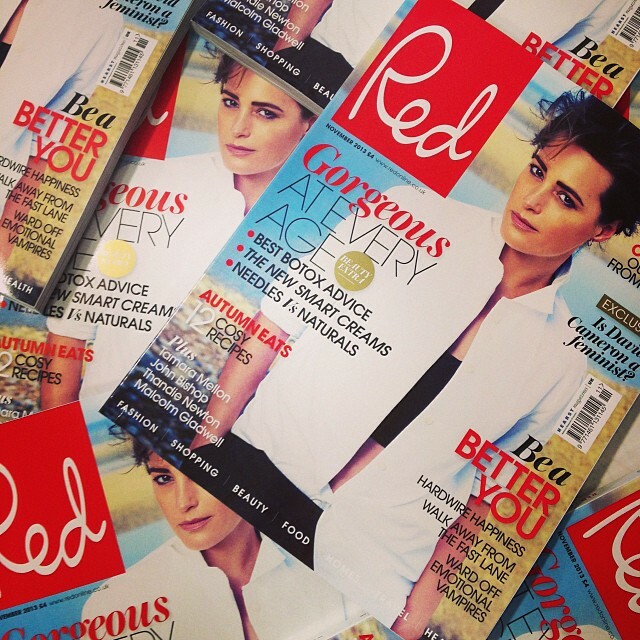 : – – – – who-we-are-in-RL has written a Cover Story (blimey) for a lovely UK magazine called Red. it’s out there now, isn’t it. we didn’t mean that as a pun. she looks nice though but we have to admit we did NOT recognize her with the lack of Doctor Martens or black clothing (is that CORAL?!) – well. did you like the bit about – oh – let’s see – we’ll go and get it…. that bit was for you. Previous Post sunsets, barry lyndon and listening to radio new zealand. brilliant. and this (cover!) article manages to tell your story in such an inspiring way! I know, fate had it so that I was late to the party, but I felt from the start, without knowing the background, that there was a special power, a story, and an aura about you; a wisdom; a strength. I must say, I have what I call the “bum brain” (in russia, you say “seek adventures for your bum” – but my bum isn’t really adventurous when it comes to health, thus the self-given name) to take u-turns before sh*t hits the pan – well at least I had so far. I hope I can keep it up and inspire others to do the same. “to check out before the burn-out” as I say. hugs and kisses from berlin! watching the YouTube video as soon as we return from DEPECHE MODE!! p.s. lovely photo in that article. and highly symbolic. CONGRATS! Loved reading the article and love the fact that you’re doing work that “makes your heart sing!” Have a glorious rest of the week! ah. yes. #CaliforniaDreaming – yes we are. So exciting and so fantastic! You rock! *blush* thank you D for being here almost since the Very Beginning! I’m still in the dreaming-of-the-life-I-want stage. Sometimes I wonder if I’ll ever get to the planning stage—I’m still too scared to take the jump!—but thank you for setting an example, I hope to be able to join you on the other side as well. I’m still in the dreaming-of-the-life-I-want stage. Sometimes I wonder if I’ll ever get to the planning stage—I’m still too scared to take the jump!—but thank you for setting an example. Oh my, you aren’t the only one that is misty-eyed!!! Happy sigh. You look gorgeous and your story (yes, even though I know it I am going to say it again) is going to help people. Isn’t that amazing???? Just think there might be one person out there (or even more but even one would be huge) who is thinking about making a life change and after reading this she/he does it! Made my day. You really do look beautiful in that photo–who was it that you were channelling? Audrey? I can’t remember. Oh yes! Diane Keaton! Always a great choice. bisou! and yes, Diane was Our Muse. Oh, oh, is this the outcome of the photo shoot where you had to walk down the very steep path to the beach and wear ballet flats???? Lovely photo and article; lovely. And, yes, you are/were brave starting again. It’s not easy but it is worthwhile. I do know Red but I don’t know if it is available here. the very steep climb without the comfort of chunky soled doctor martens was HARD! how do (real) ladies get around in those shoes? With a great deal of care, I would think! it would be so delicious to peek into Your Life on That Coast (and your travels beyond – especially to the land of kilts). Aww. This is a interweb Kleenex moment…will get the mag!